I’m on my own, can I still go diving? Yes, all our dives are guided, so there will always be at least one qualified Divemaster or PADI Instructor to guide you on each dive. 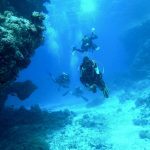 ‹ What is the SCUBA diving like in Tenerife?